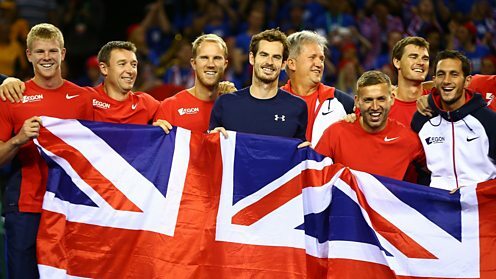 After 37 years Britain has made it to the Davis Cup final. It is sport’s largest annual international team competition, with 126 nations competing in 2015. As such the Davis Cup is hotly contended, igniting patriotic rivalry in both players and fans. Britain competed in the first ever Davis Cup and has played every year since, spending decades in the doldrums before reaching the final in 2015. So what is the story of Britain in the Davis Cup? 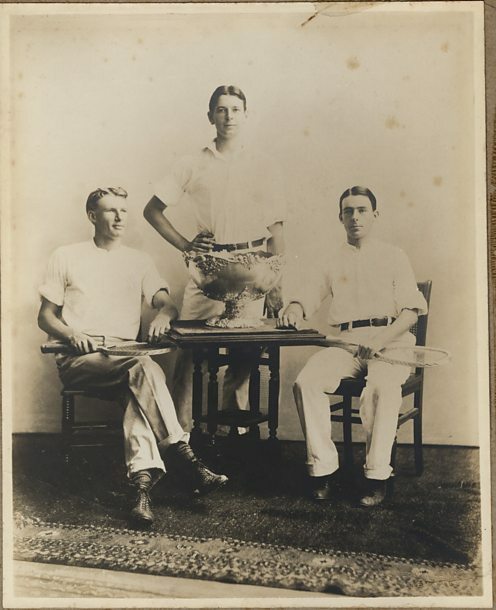 Dwight Davis (centre) with original Davis Cup team and trophy in 1900. One hundred and fifteen years before the Murray brothers revived British hopes and passions, GB competed in the first ever Davis Cup in Boston, USA. 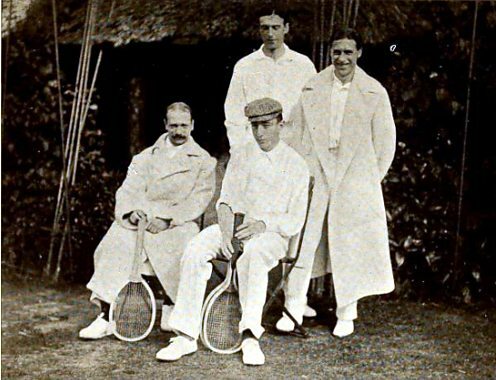 The cup – originally called the International Lawn Tennis Challenge – was founded by 21-year-old Dwight Davis and two Harvard University students who wanted to challenge the British Isles to a gentlemanly tennis match. Davis was keen to improve Anglo-American relations and he saw an annual tennis tournament as the best way to do so. Britain was engaged in the Boer War so their top players were unable to play. Unsurprisingly under Davis’s captaincy, America raced to the first Davis Cup title. British and Belgian Davis Cup teams in 1904. From left: (sitting) William le Maire de Warzée; Paul de Borman; Reginald Doherty; Lawrence Doherty. As there was no contest in 1901, it was third time lucky for Britain, when they beat the US 4-1 in 1903 and began a four-year winning streak. In 1904 France and Belgium joined the competition with Britain trouncing Belgium in the final, 5-0. Davis Cup contests are decided over five matches, or rubbers. Until 2015, 1904 was the only time Belgium had appeared in a Davis Cup final. Winning for your country and your team-mates means such a lot. The crowd were unbelievable from the first ball to the last. 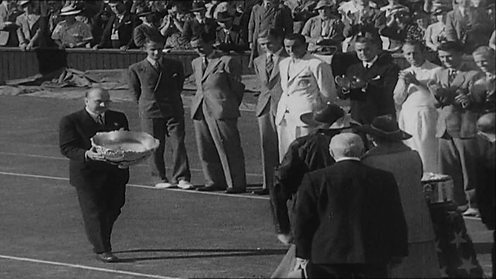 Bunny Austin and Fred Perry receiving the 1936 Davis Cup trophy. Tennis Greats (British Pathe, 1952). 1936 was the ninth and last time the Brits held the trophy. This was a golden era for British tennis. Fred Perry, one of the best players Britain has ever produced, led the GB team to victory, supported by Bunny Austin. Together they won four consecutive Davis Cup finals equalling Britain’s winning streak from 1903-06. Bunny Austin was the last male Brit to reach a Wimbledon final before Andy Murray in 2012 and Perry was the last man to win Wimbledon before Murray in 2013. Due to the lack of British success in men’s singles tennis, it took several decades for another Brit to reach the Final. 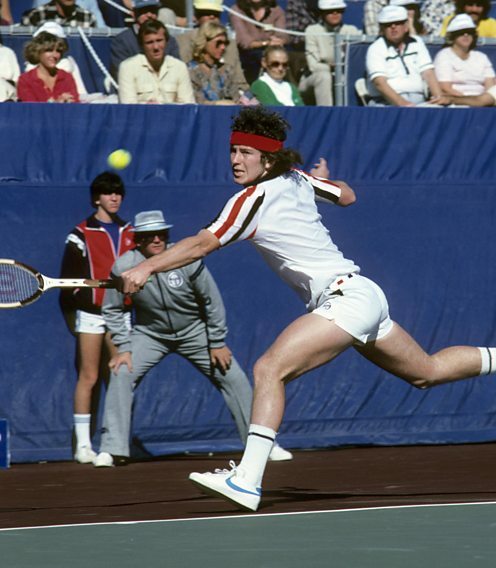 John McEnroe competing in the 1978 Davis Cup Championship. Forty two years after the Perry era, Britain finally had another chance of glory when in 1978 they faced the US again for the title. However, Britain lost 1-4 to the Americans whose team included a young John McEnroe, the future three-time Wimbledon singles champion. The British team consisted of Buster Mottram and John Lloyd playing singles, and David Lloyd and Mark Cox as the doubles pair. Despite Britain’s limited success in the tournament since 1936, we are still the only country that has participated in the Davis Cup every year it’s been held, competing originally as the British Isles until 1912. Leon Smith cheering his team on during day one of Britain's Davis Cup tie against Australia. By the 21st Century Britain had been absent from the Davis Cup final since 1978 and in 2010 they faced possible relegation to the bottom division. 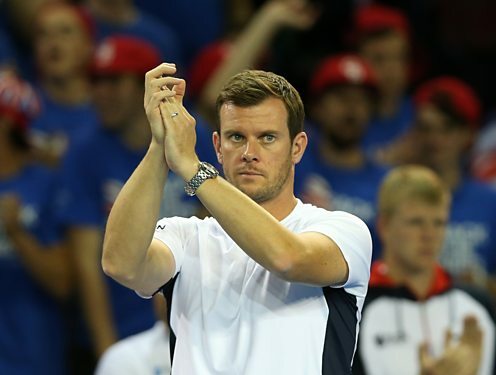 Leon Smith, the current captain of the GB team, took over when Britain faced a playoff against Turkey to remain in the third tier of the Davis Cup. Thankfully the Brits triumphed, avoiding a humiliating relegation to the lowest tier of the Davis Cup. While Britain has been out of contention for the final, Spain has dominated the Davis Cup winning five titles in the last 12 years. This incredible run is due to players such as Rafael Nadal and David Ferrer. Match point in the GB v France quarter-final of the 2015 Davis Cup (BBC / International Tennis Federation). Since September 2013 Andy Murray has been available for every tie and committed himself to trying to win the Davis Cup alongside his brother, Jamie. 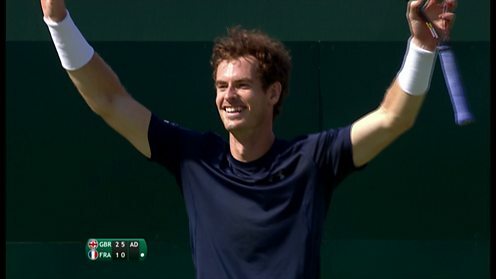 Andy has prioritised representing his country despite the fact it could affect his form on the regular tennis circuit. It has paid off. The GB team rose to the occasion and posted home wins against America and France to see them into the semi-finals. As well as having played great tennis the road to the semi-final was smoothed by the absence of Roger Federer, Novak Djokovic and Rafael Nadal. It's bloody tough, and you've got to be a special kind of competitor… It takes someone like Andy to be able to do that. Match point in the GB v Australia semi-final of the 2015 Davis Cup (BBC / International Tennis Federation). Seventy nine years since Britain last won the Davis Cup, a home win against Australia has seen the British team into the 2015 Davis Cup final. The Davis Cup has grown dramatically since 1900 when just the British and Americans were fighting for victory. The 2014 Davis Cup final was broadcast worldwide and attracted nearly 28,000 spectators – the biggest ever crowd for an official tennis match. Whatever the outcome, reaching the final of the Davis Cup is more important than it has ever been because of its huge global appeal.